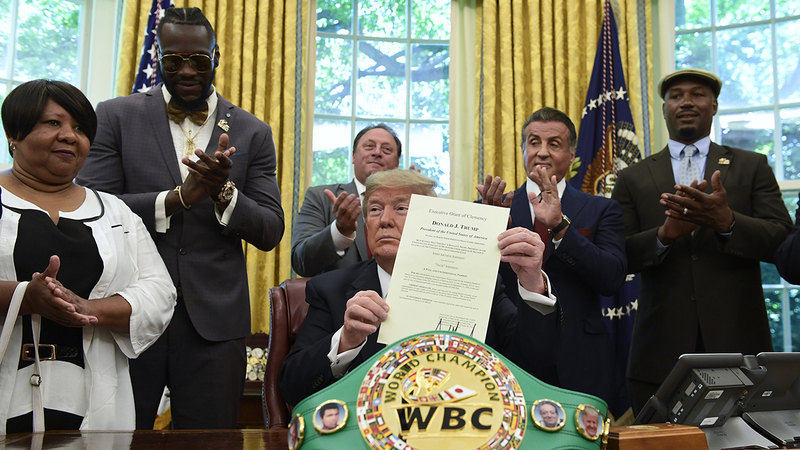 WASHINGTON, DC -- President Donald Trump on Thursday granted a rare posthumous pardon to boxing's first black heavyweight champion, clearing Jack Johnson's name more than 100 years after his racially-charged conviction. In this 1932 file photo, boxer Jack Johnson, the first black world heavyweight champion, poses in New York City. In this Feb. 10, 1943, file photo, former boxer Jack Johnson looks through a scrapbook of newspaper clippings in Los Angeles. Film Director Ken Burns, Sen. John McCain, R-Ariz., and others called for Johnson's pardon in 2004. Burns' documentary of Johnson helped highlight the racial crusade against him.